One small bump sent Aaron Phipps and his family on a seven-month detour. In her article “Prepping For Worst Case,” (The Furrow, Spring 2017) Montana-based field editor Martha Mintz wrote about emergency preparedness, using her brother-in-law Aaron Phipps’ near-catastrophic ATV accident as an example of how quickly a routine ranch operation can go horribly wrong. In this web exclusive, Martha describes Aaron’s journey towards recovery, and offers a warning to all farmers and ranchers: don’t take anything for granted. The happy singsongs of meadowlarks celebrating a warm spring day were drowned out by the cht, cht, cht of helicopter blades cutting through the air as a blue and white helicopter circled and landed on a remote pasture hilltop near Powderville, Montana. While helicopters are sometimes used to gather cattle in rough terrain, this particular helicopter was sent to gather a rancher. A very broken rancher. Earlier that day Aaron Phipps and his father-in-law, Tom Ostendorf, set out to do a quick bit of cattle work. A few weeks prior, their neighbors had joined them—as they have for generations—to help brand and vaccinate the family’s commercial cow/calf and registered Red Angus herds. Tom and Aaron planned to gather the few cows that calved after branding so they could finish one of the major spring chores on the ranch. It was a job that should have easily been completed before noon. Though they often gather cattle horseback, that day the job was relatively close to home so Aaron chose the 4-wheeler while Tom took the sport utility side-by-side. Back at the house, Aaron’s wife, Mollie, sipped coffee with her mother, Lillian Ostendorf, anticipating a bit of a day off as it happened to be Mother’s Day. Instead, they watched with increasing concern as the 4-wheeler crested the ridge without any cows and made short work of the mile-plus-long trek to the front door. “We knew something was wrong,” Mollie recalls. “When I saw it was Dad on the 4-wheeler instead of Aaron and saw how grey his face was I knew something was very, very wrong.” They met him at the yard gate where he told them to call for help as Aaron had been in an accident. Aaron isn’t a person anyone who knows him would categorize as breakable. Standing 6-foot and solidly built, he’s the person called when there’s a tough job to be done, especially one requiring brute strength. He relishes in retelling family folklore that his uncle could deadlift an engine out of a vehicle and it’s obvious he shares those genetics. His strength, work ethic and skill with a welder made him a valuable addition to the ranch workforce when he, Mollie and their boys, Robert (13) and Michael (11) moved to the ranch in 2007. “Aaron isn’t one to sit still,” Mollie says. “He’s constantly moving and working on something, even in his free time.” But on this day, he was trying to remain as still as possible. Back in the pasture Aaron was lying face down where Tom left him to get help. As the climbing sun beat down on his prone form he regretted his decision to don a heavy black coat in the chill of the morning. He couldn’t quite believe the situation he found himself in. One moment he was herding a pair out of the pasture corner, the next he was on the ground. The ATV somehow missed him and remained upright, idling nearby as Aaron lay, in the midst of sagebrush and newly sprouted spring grass, assessing his situation. Serious injury was certain. “I wiggled my fingers and toes, so I was pretty sure my spine was OK. But when I tried to roll over I could feel my pelvis shift and the pain was incredible,” Aaron says. Tom spotted the unmanned vehicle and quickly made his way up the draw to Aaron. His worry was only slightly alleviated when he found Aaron conscious and not in any apparent imminent danger. With no cell phone service, Tom headed to the house. “He took the 4-wheeler since it’s faster and I was sure to tell him to drive careful,” Aaron laughs. Back at the house, decisions were made quickly and everyone scattered to their tasks. Tom and Lillian grabbed ice packs, blankets, pillows and other supplies and raced back to Aaron. Mollie called an ambulance crew which, in true rural community style, included Aaron’s brother-in-law, George Luther, who set out on the more than 1-hour journey from Miles City. His other brother-in-law, Steven Ostendorf, was right behind them. Mollie recalls her level-headed ranch kids stepping up in a moment others might have been too dismayed to act. “Robert, 12 at the time, fed the bum calves and opened corral gates so all the livestock could get to water. Michael shut off the griddle Mom abandoned in the middle of cooking French toast and they headed up the hill to our house to pack a bag for me as they knew I’d have to go with their dad,” Mollie says. Once they were all set, they headed to Aaron’s side. He rested with a pillow under his head and ice on his back while paramedics made their way to him. 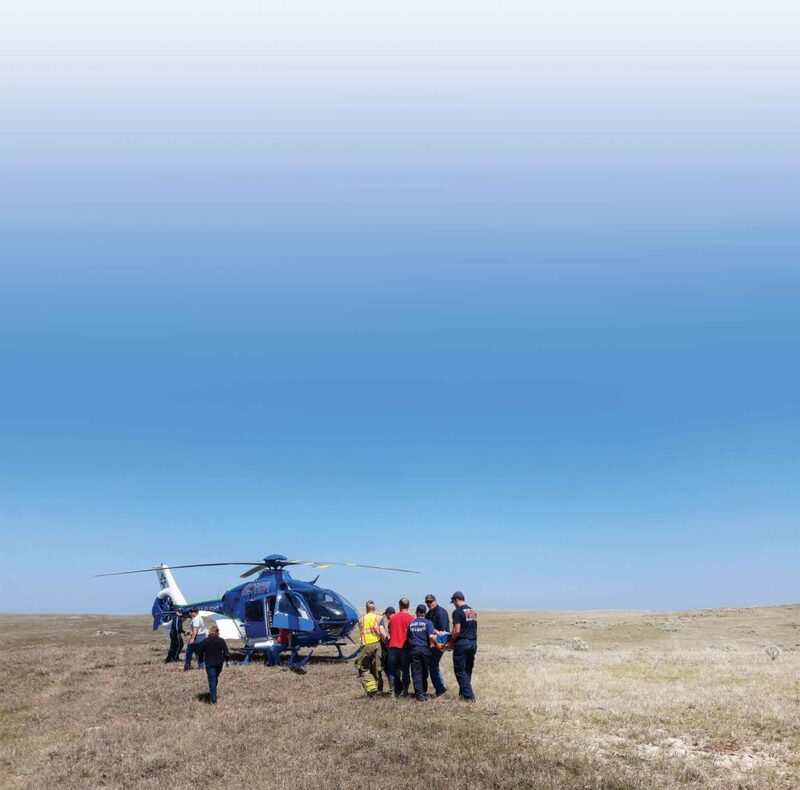 They texted the ambulance from a hilltop to let them know Aaron’s pelvis was certainly broken. They radioed for the helicopter before they even reached the pasture. After the medics arrived, they rolled him painfully to his back on a board, cut off his clothes—including the offending jacket—and loaded him in the back of his in-law’s Ford Expedition, as the ambulance couldn’t navigate the terrain. Shock did set in at that point, but the helicopter soon arrived and Aaron was whisked away to the top-notch surgeons in Billings nearly 300 miles away. With the head start, she arrived in Billings 5 minutes after the helicopter. Aaron was rushed straight to x-rays and surgery to stop urine from leaking into his body cavity as his urethra had been severed by the impact. The x-rays revealed what Aaron had guessed. His pelvis was severely fractured in three places. “It was broken in two places in the front and away from my spine in the back,” he says. The doctor suspected the two front breaks were from hitting the handlebars and the larger break from hitting the ground with an unstable pelvis. “My entire right leg was basically disconnected and sitting a few inches lower than it should have been.” The next day he underwent surgery to piece his pelvis back together and ended up with two large bolts and a titanium rod holding everything in place. He spent 2 weeks in the hospital recovering, going to physical therapy and learning how to maneuver. He would need to spend 12 weeks in a wheelchair, but could stand and swivel on his left leg, leaving him somewhat independent. Soon after he was released from the hospital, Phipps was already attending sales and visiting with friends. For a man constantly on the move, being restricted was a tough pill to take. But Aaron made the best of it. 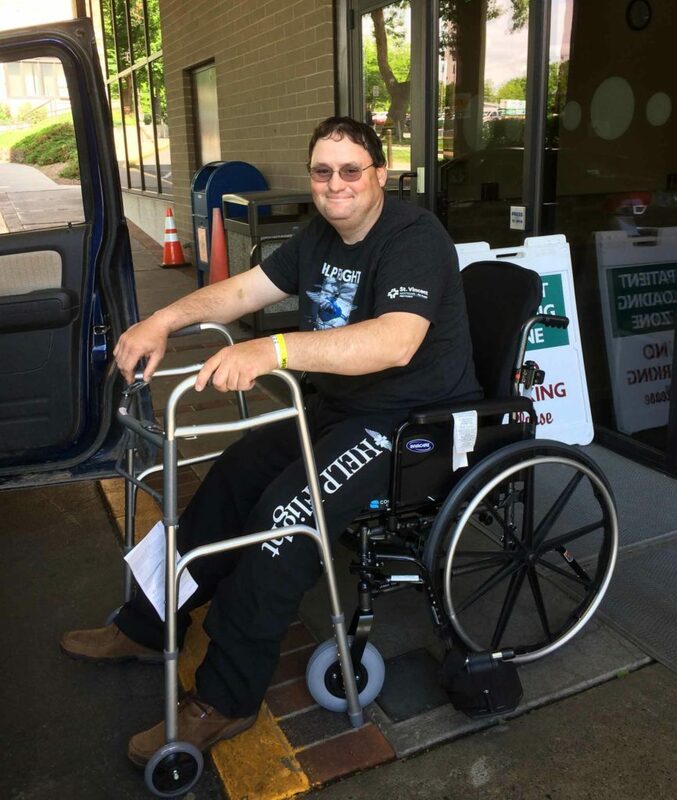 He kept upbeat with his doctors and family, even laughing after his reclined wheelchair tipped over and the hospital got to try out their new air jack gurney to get him up off the floor. “Laying in the pasture I had a good long talk with the Lord and was determined to do what it took to get better,” he says. While Aaron recovered, everyone stepped in to pick up the slack. Neighbors and family volunteered help building ramps and working cattle after teasing Aaron there were easier ways to get out of helping them at their brandings. Tom and Lillian kept Robert and Michael at the ranch so they could continue to attend their final year at their one-room country school. Lillian found herself working outside more than she had in recent years. “We were sort of lucky and unlucky in that it was very dry so there wasn’t much hay to harvest. The workload was a little lighter than normal,” Tom says. Ever vigilant, Phipps’ faithful border collie, Freckles, was so despondent that Phipps had to call him over a speakerphone from the hospital to help calm him down. “He doesn’t let me far out of his sight now,” Phipps says. Even restricted to a wheelchair, Aaron remained active, which he credits for his generally good mental well being throughout the process. Once released from the hospital he stayed with his sister, Katrina Luther, in Miles City. Mollie and Katrina got Aaron out of the house daily. 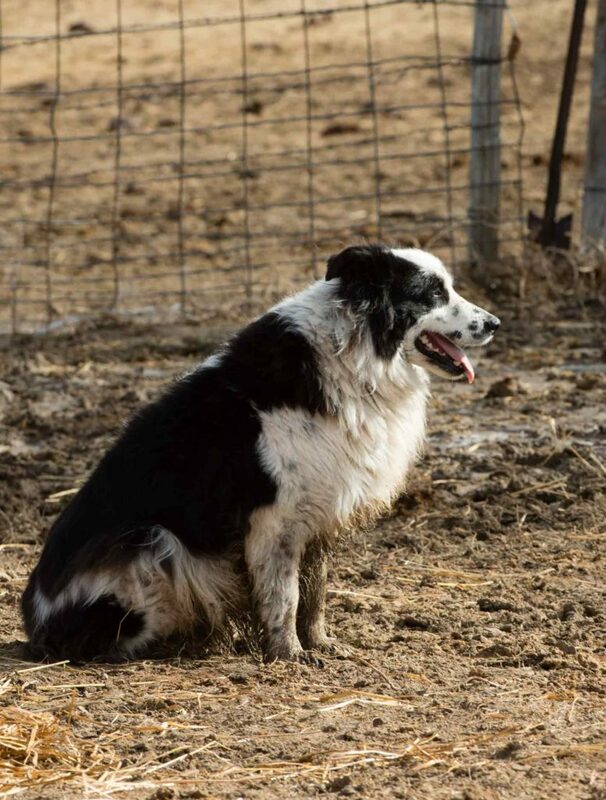 He could regularly be found at the Miles City Livestock Commission on sale day, at the farm and ranch store intercepting friends for a bit of conversation, out to coffee or on a drive into the country. Robert and Michael could soon take apart, load, unload and reassemble Aaron’s wheelchair like a marine might field strip their service rifle. As a team, father and sons could traverse the ranch checking water and cattle and doing simple jobs. “Being able to have some freedom felt really good. The time went by way faster than I thought it would,” Aaron says. After 12 weeks of healing in the wheelchair and physical therapy, Aaron was able to transition to a walker and then to walking unassisted. He underwent two more surgeries, one to remove hardware from his pelvis and another to further repair his bladder. When described in the hospital the path to recovery seemed long, but less than a year from the accident Aaron is nearly 100% and back to work. Only his shoulder, which he also separated in the accident, seems to bother him much. Even though his doctor tells him they typically see more injuries from horses than ATVs, Aaron has yet to get back in the saddle of a 4-wheeler. Or any saddle for that matter. It’s still just a bit too fresh in his mind. It’s hard to wrap the brain around how instantly life can take a dramatic turn. Even before the accident the whole family was involved with putting on farm safety events with Farm Bureau. Their preparation for emergency situations helped them to be calm in the moment and do what needed to be done. Mollie says they’re now even more vigilant about operating equipment, and the tasks their teen and preteen sons are allowed to do on the ranch. They also learned some valuable lessons about insurance. Making sure their policies are up to date and that they’re fully covered in the event of disability or death, is now part of their annual business planning. “I’ll get on my horse before I get on the 4-wheeler again,” Aaron says. “But I’ll probably get back on it eventually, too.” The detour Aaron traveled is slowly merging back with his main path in life, but he won’t soon take for granted how abruptly that path can change. "Through the years, all those colors mixed together and became what's now known as Appalachian music...". A small North Carolina fishing village fights for survival.